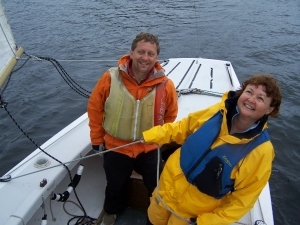 Over the course of time since her 1972 introduction to sailing Susan has instructed American Sailing Association classes and holds a U.S. Coast Guard O.U.P.V. Near Coastal , ninety miles off shore Captain’s license. Susan is a former Vermont certified E.M.T. ambulance attendant. Susan is a published sail writer and photographer and a water colorist of nautical themes. She is a charter, delivery and racing skipper and continues to provide group and private instruction anywhere boats float on planet earth and also in online format. She has cruised on a variety of vessels in between raising children and directing a Montessori school professionally and personally in a variety of waters including the Caribbean Alaska and Pacific North West, Maine, New York. Conn, Mass , Florida, and was a live aboard on a schooner on The Great Barrier Reef, Queensland, Australia. Further she provides guidance and marine consulting for those embarking on the process of proper selection and boat purchase negotiation. Susan was introduced to sailing in her teens in 1972 by a life long friend who received as a birthday gift an eighteen foot solecat beach catamaran “The Wild Lady.” She quickly learned to love trapezing and the speed, sound and athletics of flying a hull as crew. Some years passed and various sailing opportunities came and went crewing. Later Susan owned “Orion” -a traditional beamy sixteen foot Maine built wooden center board sailing dingy. Motherhood and family life called for a slower beamier rig. 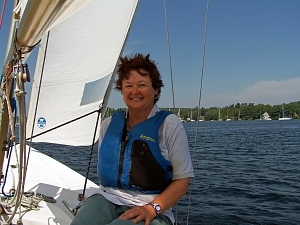 Later Susan became club member of the International Sailing School Mallett’s Bay Vermont. Leaping into one design racing she encountered and fell in love with a fleet of solings. The soling is a former Olympic class deep fixed keel 27 foot day racer. She honed her skills and attended ASA certification classes at I.S.S. leading to bare boat certification and the purchase of two boats. The first being a Nacra 5.0 “Maude” a 16 foot boom less catamaran which she raced locally on lake Champlain and later “Stella”a monohull sloop.